I hate spiders so much. I mean, reeeally hate them. And my apartment is full of those creepy things. Right now there's one huge spider somewhere under my desk. So It's not very easy to concentrate on drawing since I'm not sure exactly where under my desk it is. And I don't want to look for it. Maybe it will attack me and eat me. Ok, maybe not. But I really don't like spiders. The world would be a much better place if spider were all cute. And from one thing to another. 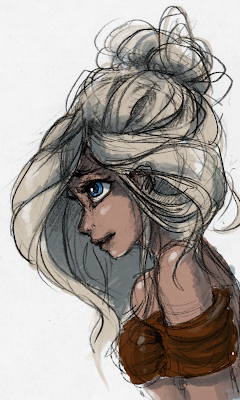 An old sketch I found when I was looking at old art on my computer. Though this isn't that old. From February I think.